LOS ANGELES (CNS) - A motorist who struck a person riding a scooter in Playa del Rey led police on a nearly three-hour pursuit Thursday that stretched to San Diego County, where the man came to a stop alongside the Golden State (5) Freeway and holed up inside his car for about 45 minutes before being arrested. The chase began around 10:50 a.m. near Sepulveda and Washington boulevards in Culver City, where police tried to pull over the suspect and his damaged red Honda Civic for vehicle code violations, according to Culver City Police Department Lt. Troy Dunlap. The vehicle had a broken rear window, Dunlap said. Culver City police pursued the suspect initially, but broke off the chase before being informed minutes later by Los Angeles police that the suspect had struck a person on a motorized scooter in the Playa del Rey area, Dunlap said. Culver City police re-entered the chase, but Los Angeles police eventually took over the pursuit. Los Angeles Fire Department officials said the scooter rider who was struck in the 7800 block of West Manchester Avenue was taken to a hospital with non-life-threatening injuries. 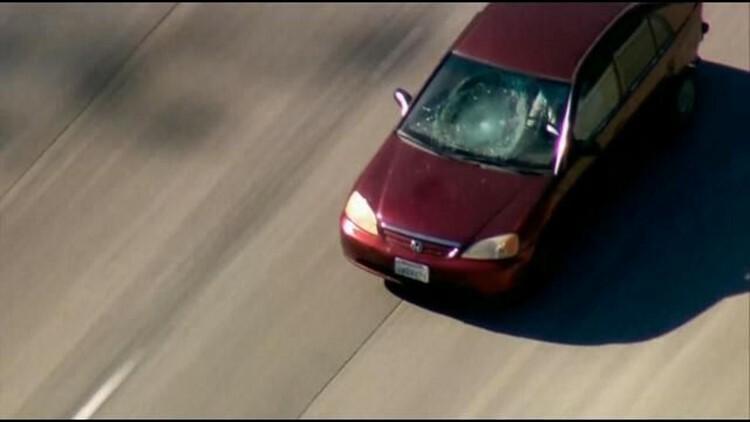 The impact, however, smashed the front windshield of the suspect's car. The chase continued at relatively slow speeds on Westchester-area streets. Police tried four times to stop the vehicle using PIT maneuvers, each time spinning the car around, but Flores was able to drive away and elude capture. The Honda lost a rear bumper during the fourth PIT maneuver. 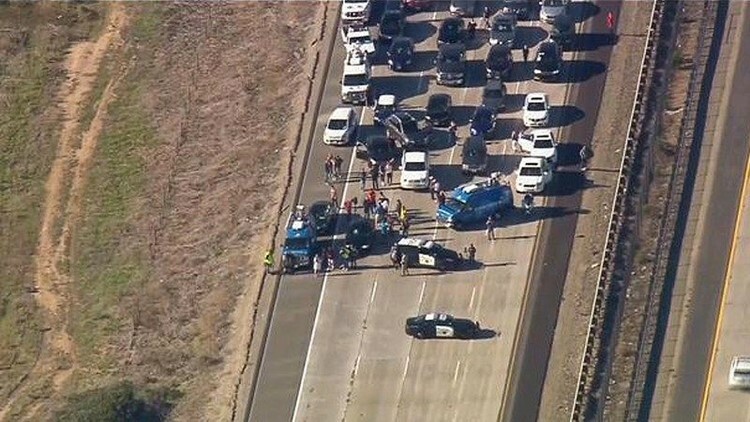 After the final PIT attempt, the suspect picked up speed and got on the southbound San Diego (405) Freeway, driving through Orange County and into San Diego County near Oceanside, where the suspect pulled to a stop alongside Interstate 5 around 1:30 p.m. -- apparently after running out of gas. Despite coming to a stop, the suspect refused to immediately come out of the vehicle, although he opened the car door at least twice. Around 2:15 p.m., the suspect opened the door and partially stepped out, at which point a police dog was deployed and officers fired two bean bag rounds, one of which hit the suspect in the face. The man was also bitten by the police dog. 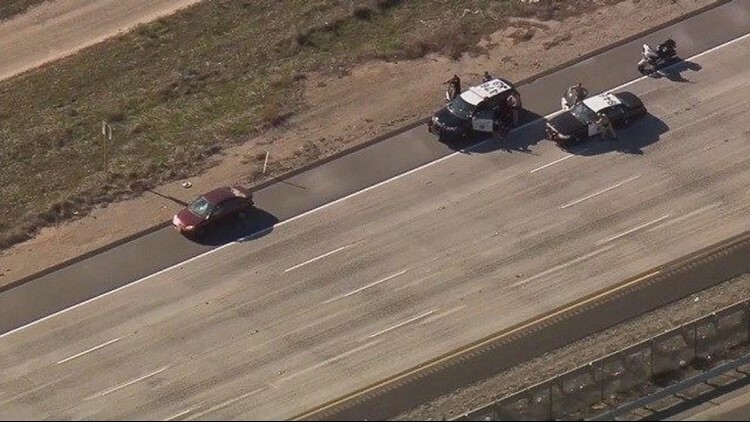 Officers swarmed the car and took the suspect -- identified by the California Highway Patrol as 34-year-old Karl Flores -- into custody. Flores' hometown was not immediately available. CHP officials said Flores was belligerent toward officers during the freeway standoff and refused to obey commands to exit the vehicle. According to the CHP, officers were in contact with Flores' wife during the standoff, and she said he had served in the military and suffered from post-traumatic stress disorder. The president of the Islamic Society of Inglewood, Javed Bava, told CBS2 Flores was a recent convert to Islam and had not been regularly seen at the mosque for most of the past two years, but showed up on New Year's Day and fought with an employee, then returned to the mosque today and confronted members just before the chase began. "He said `You're all going to go to hell,"' Bava said. "He openly said that to everybody." Bava went on to say he's worried about the day Flores is released from custody. "I'm not always there (at the mosque), but the community is there," Bava said. Bava told CBS2 Flores had recently been evicted and his wife left him with their children and Flores' relatives had tried to get him help for PTSD. 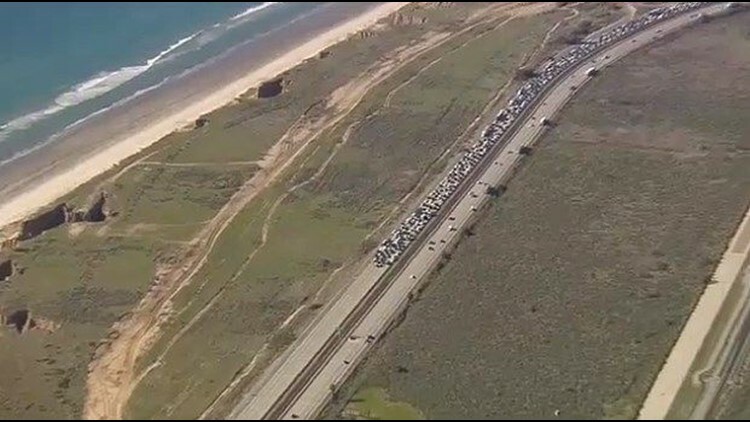 The standoff prompted closure of the adjacent stretch of southbound Interstate 5, stranding thousands of motorists. Visit the CBS Traffic page for more on the traffic closure and speed around the area. News Conference: Officer Mark LaTulippe gives an update on the chase and arrest Thursday afternoon.